Small diamonds are charming in their discretion. Small diamond pieces do not say you do not own a big stone; they murmur, "I'll have another cup of tea, thank you" or "My, I am busy today, but not too busy to enjoy life." Shown, a riding crop in diamond, platinum and gold, set with twenty-six Old European Cut diamonds measuring approximately 2 1/4 inches; price, $495 from Doyle & Doyle. Small diamonds breathe. You can layer them with your real or costume pieces. Wear them to work, to the market, to the school meeting; they will not look vulgar. The diamonds happen to be set in a piece, rather than being the piece. I would rather have an interesting design set with small stones than a rock on a piece of pipe, any day. Well, most days. For your consideration, a selection of small diamond pieces for varying tastes and price points. Vintage mid-century diamond pendant in 14k, with a tiny seed pearl at the top and five old-cut diamonds set in gold openwork. About one and three-quarter inches long, interesting enough to hold its own or chic layered with a chain. Price, $395 from Beladora II. Chaume t "Etoile" ring. Fourteen small diamonds (.42ct, G colour, VVS) set into the stars. Size 7, $1,950 from Evelyn Kay. For a classic piece of Paris, worth passing up a stack of costume rings. How hip do you want those diamonds? 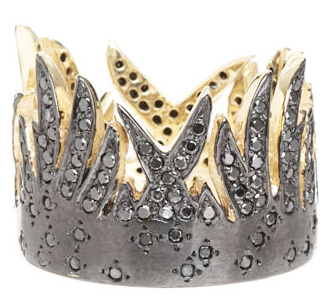 House of Waris Flame Ring, 1.05cts of black diamonds set in blackened brass. Price, $2,400 from Barney's. Alex Sepkus' designs remind me of Klimt paintings. His 18k and diamond earrings (.27cts tw, set as six diamonds in each earring) are $750, far less than on his site, at Empire Diamond. Calm diamonds: Yayoi Forest's Lucky Seven diamond ring with seven pavé diamonds in a three-quarter inch disc, in 14k gold, $560 from Catbird. Andrea Fohrmans' Brooke luminous, passe-partout necklace, a 1 3/4 inch pendant of rose-cut diamonds set in pink gold on a 16" chain. Price, $1,900 from Twist. 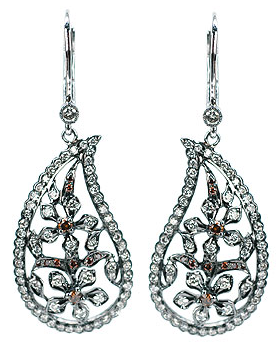 Sethi Couture 18k white gold paisley lace earrings with 1.24ct white and burnt orange diamonds, $3,050 from Fragments. Pins and brooches are back, at the edge of jewel-maven's sights. Daphne Guinness likes to pin a parade of five or six down the front of a dress. Because they are sitting out the mass-fash moment, you can pick up some exquisite pins and brooches at great prices just now. Then everyone will want one like yours. Begin with one like this vintage Mauboussin fluted ruby and diamond clip brooch, in 14k yellow and pink gold, $795 from Empire Diamond. Perfect for me, but alas, now sold. 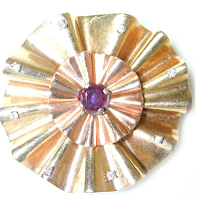 A small (1 inch by 7/8 inch) rose-cut diamond pin is probably French, and would add a grace note to a jacket or sweater neckline. $175 on sale from Ruby Lane seller Jewelry Liquidations by Amy. This Mark Davis bangle is vintage refurbished Bakelite sprinkled with pink sapphires and diamonds set in 18k gold. Subtle, quirky and the kind of thing no one will know is so precious until your wrist catches the light, and... $1,990 from Twist. A delicate 2.3mm 14k pink gold bangle with channel-set diamonds (.55 ct tw) mixes with anything you own. Price, $1,399 from OroLatina. When dealing with online vendors, speak to them. They can provide additional photos and more detail about the condition, if you are buying vintage. Even though the diamonds are small, ask if they know the colour and clarity. Information on cutting grade is hardest to get. Well-cut little pointers will sparkle from across a room. Some pieces may not come with this information, so ask for the return policy in writing. Then, choose your small treasure and enjoy every day! My two faves are the "Etoile" ring and the bakelite bangle, but all of these are really interesting pieces! You are such a sleuth when it comes to finding the unusual and lovely! 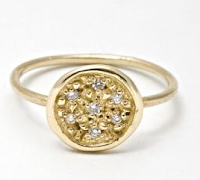 That Etoile ring is divine...small diamonds have not been on my radar but that can change! Thank you. I agree with you completely. Small diamonds are my favorites, even when they are next to some big ones:). Of course, Tiffany understands this too, right? Their Etoile line, their keys, all rely on nicely set little stones and then they whack the bejeezus out of their margins....Wonderful post, thank you. Oh, those paisley earrings . . . sigh. . .
Oh I love that phrase: "rock on a piece of pipe". Fits my view of the situation completely. LPC: Tiff's keys too knocked off for me to be covetous. Do love real, old brass or silver keys worn on a chain; one can find them for peanuts at "les puces". Tiffany have beautifully-cut diamonds and some argue for resale value of the brand. Chatelaine: If well-designed and made, it will not catch or snag. House of Waris I would hope will do a good job, for that price. Pseu: Those are Pseu pieces, yes! hostess: The off the radar quality can keep prices relatively low- except (as L points out) for the new, branded items. And the first one is for my hb, right? I love it! I could borrow it. I too am curious.. Where do you find all these nice pieces? metscan: it was included with you in mind! All sources are given and usually linked. I know where some things are from decades of looking and occasionally buying- but it's a big world, there are many more sources. Thank you for answering so fast. As I examined the picture more closely, I noticed that it is a brooch, so that means that I would be the one carrying it!! It looks so sophisticated. I especially like the vintage pieces. 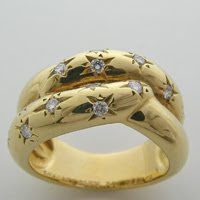 I have several rings w/ small diamonds--from the early 20th century. They belonged to my grandmother and great-aunt. My mother kept the bigger stones. I'm not really interested in those. Great pieces, and at reasonable prices. Thank you for including the pendant from Beladora2.com in your group. *sigh* In this era of bigger-is-necessarily-better, it feels positively rebelliouos to wear dainty diamonds. Oh, I love that Bakelite bangle and the Etoile ring ... and the tiny little pin at the end. 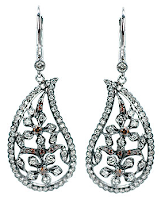 I yearn for the Alex Sepkus earrings. The tiny spirals are wonderful. Frugal: Hop you wear them often! s: Well put, I do think it is far more original to wear an interesting piece set with large diamonds than a boring ER. Do you know the Chanel quote, "A woman with a diamond ring might as well be wearing a price tag around her neck?" Belle: How could I not, great pieces! tiffany: There are many delightful small diamond pieces out there. But cheap micropavé abounds too. One can go too small. I think with small diamonds you need multiples, not just one. Love that ring of fire! A bit late to the party, but I wanted to chime in -- I love Anne Sportun's jewelry with teensy diamonds, especially because she offers many pieces in white gold as well as yellow (I'm a white metal girl). Though her pieces with huge semi-precious stones are pretty snazzy, too. Rubiatonta- Anne Sportun's jewelry is wonderfully wearable and I am happy to mention this local Toronto designer whose work is sold by other boutiques, some online (as well as Sundance. Many of her pieces are too dainty for me, but I love them on others. Robin: I will remove comments when they include a link to a commercial site which is not of the sort I would choose to promote through my blog. Small diamonds are charming in their discretion. your jewelry collection are classic and unique in designs. Thanks for sharings.